Join Arrowmen from all across New England at the 2019 New England Fellowship! The Section NE-1 leadership is looking forward to providing action packed activities, intuitive training, exciting shows, and inter-lodge camaraderie. 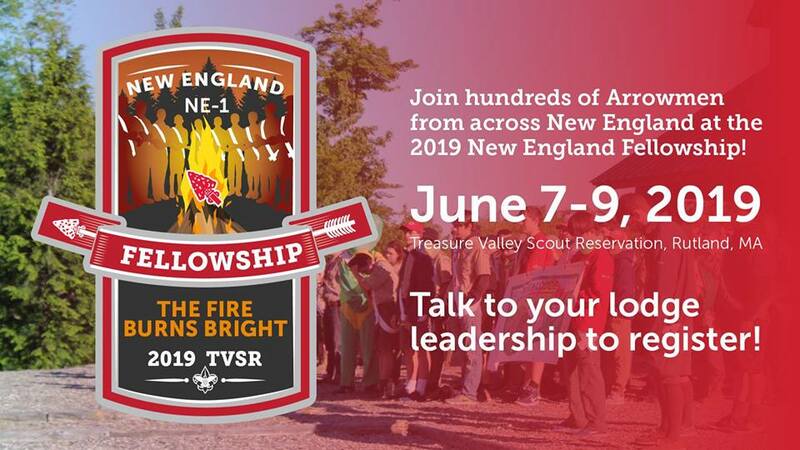 This year, the NEF is taking place June 7th-9th at Treasure Valley Scout Reservation in Rutland, MA. The event is open to all Arrowmen in Section NE-1. Registration is managed through individual lodges - contact your lodge leadership if you have questions about registering. Sleeping arrangements during the event include summer camp style tents, and all food is prepared and served by the service lodge. Register by June 6th (snail mail must be in office by June 2nd Candidates may register subject to successfully being inducted at May 18-29 weekend. If for some reason you are not successful in being inducted, your fee will be refunded. Send a copy of your med form Parts A&B to the lodge address. Bring a second copy with you. This year we will be possibly setting up transportation by bus. Please answer the question on the registration form if you are interested our first look at the cost is around 22-25$ round trip but we are still looking at bids. Please register soon we will need to arrange car pooling with those attending!